Lock in a great price for Casa Amarelo Boutique Hotel – rated 9.2 by recent guests! Great location and beautiful old home in Santa Theresa, but still walkable to Lapa and lots of restaurants and nightlife. The view from the pool was gorgeous. We thoroughly enjoyed our stay here. A beautiful 1904 home. Room on a lovely garden. Pool so refreshing. The bed was the best. A made to order breakfast tasty. Would recommend to family and friends. Beautiful and charming property built up into a hill - you enter through a tunnel then take a small elevator up! The staff spoke excellent English and provided great recommendations. A beautiful villa from 1904, tastefully decorated and restored, making you want to stay forever. We were immediately caught by the great atmosphere of this location - highly recommended if you’re looking for a place that makes your stay in Rio even more special. A truly beautiful oasis in the city. The interior is gorgeous, down to the smallest detail. It is light and airy and quiet. 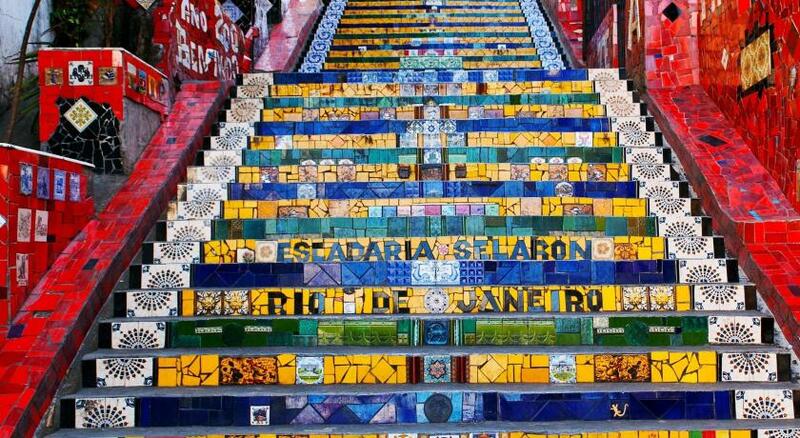 It truly is my new home from home in Brazil. The pool is clean and cool. Perfection! The house was beautifully decorated and very calm - a perfect escape from the hustle and bustle of Rio. Casa Amerelo and the staff were wonderful but I wouldn't label it a hotel. It is more of a B&B or guesthouse. I liked the house and the gardens. Both were beautiful. Staff were friendly and helpful. Great staff and elegant design boutique casa hotel located in an extremely bohemian centre location. Joanna and Marrian really made you feel at home and went for the extra mile to help you feel relaxed and happy. Highly recommend I slept like a baby Ta mate! Beautiful, historic building with excellent decor and furnishings. Casa Amarelo Boutique Hotel This rating is a reflection of how the property compares to the industry standard when it comes to price, facilities and services available. It's based on a self-evaluation by the property. Use this rating to help choose your stay! 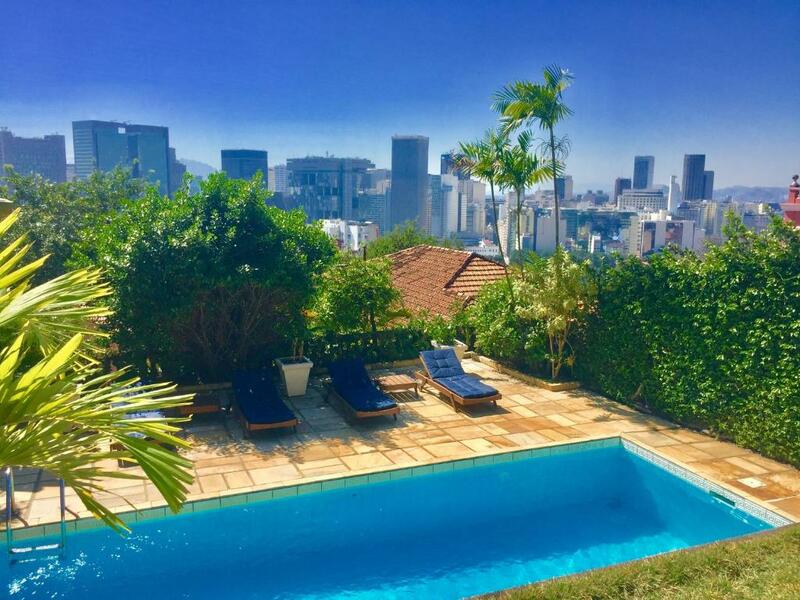 Located in the historic Santa Tereza district, the Casa Amarelo Boutique Hotel combines the authenticity of a building dating back to 1904, the elegance of the French design and the Brazilian hospitality. This boutique hotel was created by the French designer Robert le Héros, providing a charming environment with a pool where you are invited to relax while savoring a caipirinha and admiring a privileged view of the city center. You can also breathe the pure air from the vivid green tropical garden inhabited by songbirds and other animals, such as little monkeys called saguis. Casa Amarelo Boutique Hotel lies in a quiet area of Rio de Janeiro, close to the Municipal Theater and beautiful houses, museums and embassies. When would you like to stay at Casa Amarelo Boutique Hotel? Tastefully decorated, this suite offers air conditioning or ceiling fan, plus a hairdryer. Private parking is available on site (reservation is needed) and costs BRL 50 per day. This bright, spacious suite features a panoramic mountain and city view. Additionally, it offers an iPod docking station, air conditioning and private elevator access. With a patio and garden views, this chalet features a king-size bed, satellite TV and fan. French touch in Brazil, Casa Amarelo’s 7 suites are comfortable, neat, and updated in a contemporary style. Modern luxury abounds and the guests will appreciate the elegantly designed atmosphere and the excellence of a real « art de vivre » experience. It is a magical place loaded with history in which modern layout and ancient construction form a perfect and charming match. The interior design is signed by Robert le heros, a French brand specialized in interior design and accessories. Laurent Gelis the Art Director created this touch of stylishness « boheme », perceptible all over the place. Enjoy sitting by the pool while you plan your day. Casa Amerelo makes you feel you are in your beautiful home away from home in the most charming spot in a remarkable city. House Rules Casa Amarelo Boutique Hotel takes special requests – add in the next step! One child or adult is charged BRL 190 per person per night in an extra bed. Casa Amarelo Boutique Hotel accepts these cards and reserves the right to temporarily hold an amount prior to arrival. I expected a hotel but it was a guesthouse. It was very hot in Rio at the time but only the main rooms were air conditioned. The rooftop with the pool is poorly maintained and not inviting (as suggested by the pictures). Very poor check in service. My flight was delayed and as I arrived after the check-in time I couldn't access the hotel as there was no night-time receptionist. I had to book another hotel which was difficult, costly and inconvenient. A TV would be nice! Absolutely astonishing villa with beautiful interior and extremely nice stuff. The area is very big as well as the room. It is a perfect mix of old architecture and a soft renovation. Shower and hot water could have been better. The house is beautiful, peaceful and very comfortable! The staff is always available and helpful for anything you will need. Breakfast by the pool is a must! Beautiful house in a fantastic location. Highly recommended!